*The Man Who Came to Dinner (1939, with Moss Hart), an unforgettable burlesque of America’s cult of celebrity. Dinner at Eight, The Royal Family, Stage Door. These three masterpieces stand as permanent and hilarious testament to the cream of an epoch. Edna Ferber and George S. Kaufman inebriated America during the Prohibition Twenties, then made everyone forget the Depression in the Thiries via gales of sophisticated laughter. 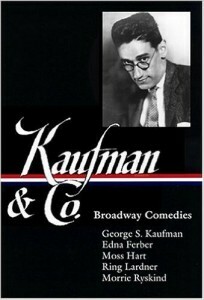 The dynamic playwriting duo created three smash hits together: The Royal Family (1927), Dinner at Eight (1932), and Stage Door (1936). The Best of Robert Benchley, a compendium of 72 of his funniest stories. There is, for example, his meditation on the future of the species, Future Man: Tree or Mammal, in which he posits that the humans of the future will be both brightly dressed and legless (you’ll have to read the essay to find out why); or The Real Public Enemies, in which he laments the hostility of inanimate objects. Seventy-two timeless pieces celebrate the humorous side of life’s annoyances and the author’s suggestions for coping–or not coping–with them, and address such topics as government imbibing and Christmas finances. Artwork by legendary New Yorker artist Peter Arno only adds to the joy of this edition. The great humorist at his best — 39 prodigal pieces never before collected, all from Liberty Magazine in the early 1930s. Gentle, urbane wit aimed at taxes, horse racing, Europeans who live their own stereotypes, sand kicked in one’s face at the beach, much more. A collection by Nat Benchley of more than 60 pieces of his father’s that he thinks ‘stand up the best over the years’. Among these gems are “Take the Witness!”, The Social Life of the Newt, From Nine to Five, French for Americans, Is This the Mystery Link?, Christmas Afternoon and Kiddie-Kar Travel. Winner of the 1924 Pulitzer Prize, So Big is widely regarded as Edna Ferber’s crowning achievement. A rollicking panorama of Chicago’s high and low life, this stunning novel follows the travails of gambler’s daughter Selina Peake DeJong as she struggles to maintain her dignity, her family, and her sanity in the face of monumental challenges. Heralded by one reviewer as “the most serious, extended and dignified of [Edna] Ferber’s books,” Fanny Herself is the intensely personal chronicle of a young girl growing up Jewish in a small midwestern town. Packed with the warmth and the wry, sidelong wit that made Ferber one of the best-loved writers of her time, the novel charts Fanny’s emotional growth through her relationship with her mother, the shrewd, sympathetic Molly Brandeis. The short stories in this collection take the reader from small-town Wisconsin to the bustling streets of New York and Chicago and back again. While they range greatly in length and tone, they all share the trademark wit and affectionate insight of Edna Ferber. Showcasing the facility with words that made her a mainstay at the Algonquin Round Table, Ferber explores some of her favorite themes: the role of women (especially strong or unconventional women) in modern society, the mores of the midwestern small town, and the changes over time in relationships between parents and children. The stories gathered here are beautifully observed chronicles of early twentieth-century life and are filled with characters who, despite their very human foibles, are all bestowed by Ferber with warmth and dignity. Roast Beef, Medium is the first of three volumes chronicling the travels and trials of Emma McChesney. The illustrations by James Montgomery Flagg, one of the most highly regarded book illustrators of the period, enhance both the humor and the vivid characterization in this wise and high-spirited tale. The stories featured Emma McChesney: smart, savvy, stylish, divorced mother, and Midwest traveling sales representative for T. A. Buck’s Featherloom skirts and petticoats. With one hand on her sample case and the other fending off advances from salesmen, hotel clerks, and other predators, Emma holds on tightly to her reputation: honest, hardworking, and able to outsell the slickest salesman. In this second of three volumes chronicling the travels and trials of Emma McChesney, the plucky heroine trades in her traveling bag and coach tickets for an office and a position as T. A. Buck Jr.’s business partner. Along with this well-earned promotion comes the home–with a fireplace–that she had longed for during her ten years on the road. 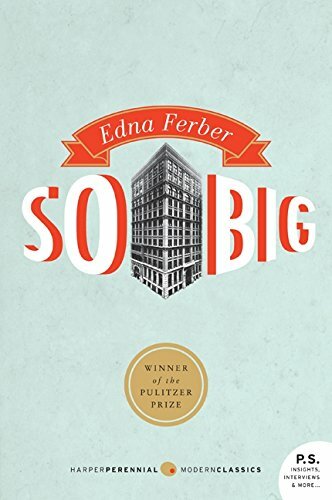 In this bracingly modern novel, first published in 1914, Ferber contrasts the virtues of talent with those of experience to provide a fresh, readable, and smartly entertaining contest between a mother and her adult son. Personality Plus is enhanced by the drawings of James Montgomery Flagg, one of the most highly regarded book illustrators of the period. In this final of three volumes chronicling the travels and trials of Emma McChesney, first published in 1915, Emma’s son, Jock, has moved to Chicago with his new wife. Struggling with a newly emptied nest, Emma dives into a whirlwind South American sales tour to prove she hasn’t lost her touch. By turns sales pro, newlywed, fashion maven, and anxious grandmother, Emma symbolizes the ideal woman at the dawn of the twentieth century: sharp, capable, charming, and progressive. Emma McChesney and Co. is enhanced by the drawings of J. Henry. Copyright ©1998-2018 Kevin C. Fitzpatrick. All Rights Reserved.